There aren't many sights that are as peaceful or as beautiful as seeing dainty little colorful butterflies in the meadow. 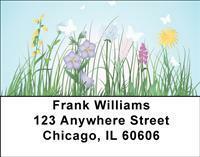 It might be cold outside, but everyday is spring in your checkbook now! The beautiful pastel colors and breezy landscapes can transport you to a sunnier day, no matter where you are!